Here’s our Top Picks for the Weekend of September 15th & 16th! Get your hands dirty with the Great American River Cleanup! Or find a cleanup closer to you. Placer Nature Center’s magical Harvest Tea Party is a sure-fire hit. Kids can enjoy tea with fresh herbs and frolic in the wilderness! Have an old-fashioned flapjack breakfast at Sutter’s Fort. Learn how to start a simple family compost bin with a free 1-hour class. Or take a free family birdwalk with a Naturalist at Effie. And of course it’s Sac Open Studios for one more week… let kids peek into an artist’s real workspaces and learn about their processes. Perfect, sunny highs of 79/81 forecasted for Sat. & Sun. Enjoy the gorgeous weather! Central Coast Carnage Skate Jam. Show off your skateboarding tricks or just watch the exciting action take place.Age groups: 8-11/12-14/15-17/18+. Sign ups at 11:00AM. Starts Sat. 12pm. $10 entry fee. Mather Field Skatepark. Storytime at Barnes & Noble… featuring Goodnight Goon: A Petrifying Parody. A beloved classic gets a kind-hearted send up in this clever parody that will keep kids laughing. Free. Sat. 11am. 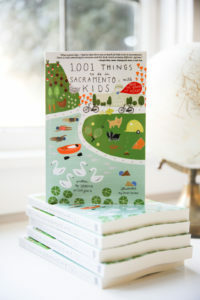 Barnes & Noble Arden Fair, Natomas, Roseville, Folsom, and Citrus Heights. Thank a firefighter in-person at a Fire Station Open House… this week Sat. Station 43 is open, located at 4201 El Centro Rd. Meet Sparky the Fire Dog, tour a real station, see the apparatus and equipment used to save lives, learn the day-to-day duties of firefighters, and get some emergency planning tips for your own home! Sat. 2pm – 4pm. Tiptoe around a real artist’s studio and ask them where they get their ideas. Download the guidebook and maps for Sac Open Studios here. Watch Sacramento State’s women’s soccer team battle it out with Saint Mary’s at Sac State Sunday 1pm – 4pm. Go Hornets! Make a flower lantern and go on a Sunday walk at dusk… Have the kids collect wildflowers that will be easy to flatten. Paint the outside of a washed glass jar with glue or Modge Podge and arrange the petals to the outside of the jar. Set it to dry for an hour, and carefully sponge on another layer of Modge Podge. Let dry. Pop in a tea light candle for a beautiful floral lantern ready for a magical evening walk. If you want a handle, just use crafting wire or pipe cleaners to wrap around the mouth of the jar. Here’s our Top Picks for the Weekend of September 1st & 2nd! Now that the kids are back in school, they’ll be much more enthusiastic for weekends. Build on that momentum and do something different! Make a new Labor Day Weekend family tradition—it can be big, like floating on a pretty lake, or small, like pressing some late summer flowers into a book. Have a great weekend! Sunny highs of 90/91 forecasted for Sat. & Sun. Let the kids pick a bucketful of half-price u-pick flowers. For those who missed our previous mention of Flourish Farm, they are ending their season with a half-price u-pick flower sale. This means sale prices will range from $2.00 for an 8 oz (1 cup) mini-bouquet to $15.00 for a 5 gallon bucket packed full of flowers. Bring your containers of any size, and they will figure out the discounted price. Cash sales only. Lots of beautiful flowers still blooming including zinnias, sunflowers, celosia, snapdragons as well as herbs such as lavender, sages, mint, and lemon balm to mix into bouquets. There is very limited parking on the site, but lots of free parking across 5th Street in the lot behind Brodericks. Check-in for a brief orientation if you have not picked flowers at the farm before. Sat. 9am – 12pm. Flourish Farm, 317 5th St. in West Sacramento. The Great Train Robbery (for older kids & teens). Take a ride on the wild side, and live out your own old Western showdown aboard the Sacramento RiverTrain’s Great Train Robbery. Keep a weathered eye on the horizon for greedy outlaws! But don’t fret, the on-board Marshal will keep everyone safe! Here’s our Top Picks for the Weekend of August 25th & 26th. Kid fun runs, fishing in the city, free gardening inspiration for the whole family, a fun dinner night at WAL, a photography walk, nachos festival, Jewish food fest, and family comedy show… wow. Plus one of our absolute faves, the Waste-a-Polooza, which teaches kids how we take care of our water and sewer systems. It’s actually really great. The weekend forecast is sunny highs of 89/84 for Sat./Sun. Enjoy the cooler weather and stay outside and play! Travel through time with Time Travelers Bazaar 2018. Featuring vendors from around the globe and throughout time, this event also hosts Fan Groups, Clubs, Performers and Special Guests. Here’s our Top Picks for the Weekend of August 18th & 19th! Local tomato season is peaking and it’s all for you! Find some colorful, kid-friendly sunny yellow or green zebra striped ones at your farmers market. There’s a canning party & campout in Dixon that sounds fantastic! See some super-rare baseball artifacts at a special exhibit at the California Museum. Plus a NY Times bestselling author gives story writing tips in Elk Grove—take all teen writers! It’s sunny high’s of 99/97-degree forecast for Sat./Sun. Stay cool and hydrated with water-rich fruits! Sakura-mento: Japanese-Americans in the River City. (Recommended for teens interested in cultural issues. )By 1910, Sacramento had become the 4th-most Japanese-populated city in California and had a thriving Japantown. That all changed with World War II. Hear the amazing story of Japanese-American immigrants’ battle to overcome discrimination. The Old City Cemetery Committee will tell you about the farmers, the merchants, and the soldiers from the 100th Battalion and 442nd Infantry Regiment, who fought to free Europe while their relatives were in camps back home. Sun. 1pm – 2:30pm. Free. Sacramento Historic City Cemetery. Here’s our Top Picks for the Weekend of August 11th – 12th! Wide Open Walls is surrounding us with more beautiful art in the city—get downtown to check out the sites! There’s mapping & treasure-hunting at Koobs Nature Area, and a traditional kid-friendly Pow Wow. Get crafty with bats at the Yolo Bypass Wildlife Area. And don’t forget, stone fruit is in season. Grab a basket and fill it up with your faves! It’s a sunny 94/91-degree forecast for Sat./Sun. the weekend. Happy August! It’s Wide Open Walls week… when Sacramento gets beautified with more public art for all to enjoy! Download this map and artist reference, and check out all the works in progress with the kids. Bring some ice-cold water or note of thanks for the muralists! It’s stone fruit season! Let the kids wake the house up early and get out for the for best fresh peaches, apricots, and other stone fruit at the Saturday Midtown Farmers Market or the Sunday Farmers Market under the I-80 freeway (8th & W St.). Go home and make a peach cobbler with vanilla ice cream! Or just sit under a shady tree and eat all of your peaches in one go. Mama Mia! Catch the last matinee show of this Broadway classic with older teens. On the eve of her wedding, a daughter’s quest to discover the identity of her father brings three men from her mother’s past back to an island paradise. Featuring over 20 ABBA songs, including the hits “Dancing Queen” and “Take a Chance on Me,” this high-spirited, feel-good international sensation will have you singing and dancing in the aisles. Sun. 3:30pm. Invite friends and sing your heart out at karaoke with the kids. Sunday 4pm – 7pm is half-off karaoke rooms at Oishii Sushi and Karaoke on K Street. Sky KTV Lounge on Front Street has half-off rates every day 6pm – 9pm. Here’s our Top Picks for the Weekend of August 4th – 5th! The free kite-making workshop in Elk Grove is not to be missed. Older kids will love meeting real-world stylists and fashion experts for tips on thrift-shopping, also free! Sunflowers are in bloom and ready to be picked at u-pick farms, just $6 a bunch. And we have three art gallery suggestions for a lazy, art-filled Sunday. It’s a sunny 92-95-degree forecast for the weekend. Happy August! Fun on the Farm: Pollinators Experience. Kids will explore the Youth Garden and the American River Ranch learning about what pollinators are and how they help us grow food. Participants will have the opportunity to engage in various fun, educational activities, make a farm fresh snack, meet the farm animals and create something to take home. Jenn MacLeod from Soil Born Farms will instruct. This is event is suggested for Ages 3-9. This is a child-focused farm experience. Obsess about peach season at the Carmichael Park Farmers Market Peach Festival! Enjoy a day of all things peaches and taste the many peach inspired products and specialty items prepare by many vendors. This event included free kids crafts, games, and prizes, peach eating contest, a peach walk, best peach dessert contest and more! Live entertainment, chef demos with local chefs with peaches as the main ingredient. Canning demos teach you how to can, pickle and/or sweeten your peaches to eat at a later date. Free. Sun. 9am – 2pm. Carmichael Park. Here’s our Top Picks for the Weekend of July 28th & 29th! So many dance events to celebrate Dance Day–what better way to beat the heat than be indoors celebrating the world of dance, and maybe taking a couple free pop-up dance classes for some spontaneous fun. Of course, the Courtland Pear Fair is here on Sunday. Go early to beat the heat. It’s also the last weekend to catch the festivities at the Cal State Fair. Just stay cool and partially in water all weekend! Visit the Sacramento Fire Department’s Station 18 (746 North Market Blvd.) for some open house fun Sat. 2pm – 4pm. Cool off at a nearby lake and do some family-friendly floating, paddling, or kayaking. Jenkinson Lake, Rollins Lake, Lake Natoma are favorites. Happy Valley on the Consumnes River is always exciting for kids (near Placerville). A short half-mile hike in and you’re greeted with nice, shallow areas to splash around. Always bring life jackets for kids in open waters. Whoooo’s There: Owls. Meet an owl and take an eye-opening look at these amazing hunters at the Effie Yeaw Nature Center. Free, $5 parking. Sun. 1:30pm – 2:30pm. Check out some science exhibits and then take a spin on a few rides at the California State Fair. UB40 headlines the Golden1 Main Stage on the last and final day, Sun. 8pm – 10pm, if you want to stay up late and reggae dance with the kids. Sorry for the inconvenience, but there will be no top weekend picks this week. Please check back next week Wednesday for our next weekend picks! Thank you.